As with most von Trier films, The House That Jack Built feels designed to be as divisive as possible. It follows serial killer Jack (Matt Dillion) over the period of twelve years, focusing on five randomly chosen incidents that he narrates to the mysterious figure Verge (Bruno Ganz). During the opening, Verge warns Jack not to “believe you’re going to tell me something I haven’t heard before”, quite a self-reflective line. Given the subject matter, anyone familiar with von Trier’s filmography should know what to expect. As someone who considers von Trier to be one of the great filmmakers of our time, I went into this film with high hopes. I’m glad, and somewhat ashamed to say, that I loved every minute of it. The film’s graphic content – which includes animals being mutilated, children being shot and extended references to Nazism – will be a sticking point for many viewers. It’s by no means an easy watch, especially in the unrated cut that I’m reviewing (the director’s preferred version). The violence is shocking, but for a film like this it must be, otherwise it would completely fail as an in-depth look at the psyche of a serial killer. Most of the gory moment are blink-and-you’ll-miss-it anyway, with most of the unease coming from the prolonged build-up to the murders. What most surprised me about the film was how funny it was. Jack may be a serial killer, but he also has OCD and a cleaning disorder, leading to some darkly humorous scenes as he cleans and recleans a murder scene, even going back to clean again after the police show up. Matt Dillion is fantastic and endlessly watchable in the title role despite the horrendous crimes he commits. The supporting cast are also brilliant with Uma Thurman and Riley Keough as the standouts, the former as a stranded driver who needs help fixing her broken jack (very clever Lars) after her car breaks down, and the latter as a woman Jack calls “Simple”, the tensest scene in the film as she slowly realises who Jack is and what he intends to do to her. There’s so much to say about this film that I can’t fit into this review, from the excellent cinematography by Manual Alberto Claro, to the shear insanity that is the final fifteen minutes, a hellish descent into madness that feels like it was guest directed by David Lynch. The abrupt cut to credits as Hit the Road Jack starts playing (the perfect song choice) had my jaw on the floor. 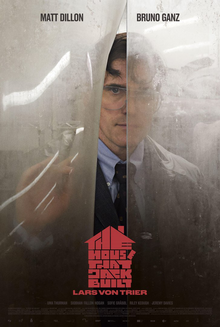 The House That Jack Built feels like a culmination of Lars von Trier’s entire filmography. At points it’s a back-handed apology for his earlier films, at others a middle finger to all his critics. I mentioned earlier I was somewhat ashamed to admit I loved it, and I have no doubt that is von Trier’s intention. You’re supposed to feel guilty about liking it. While that may be the case, there is no denying it is one of the most fascinating films I’ve seen in a long time.